The Cap-Trap™ kit is a precision measurement system for complex, fluorescent biological samples collected in capillary tubes. The Cap-Trap™ is constructed using materials and processes that result in ultralow autofluorescence, and is supplied as a kit containing heparinized capillary tubes and tube sealant. Plain glass capillary tubes can also be used. When using the recommended capillary tubes, the Cap-Trap™ window exposes exactly 10 µL of sample. 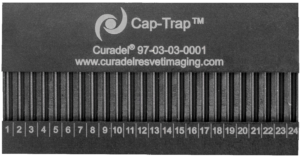 24 capillary tubes can be held by a single Cap-Trap™ and at least 4 Cap-Traps™ (96 samples total) can be imaged simultaneously using FLARE® imaging systems. Our Cap-Trap™ kit (HYPERLINK) contains two Cap-Trap™ and all the supplies you need for get started.